Home › Women Rights › Arab women have self esteem and respect yourselves: The age of Harem is past and way gone! 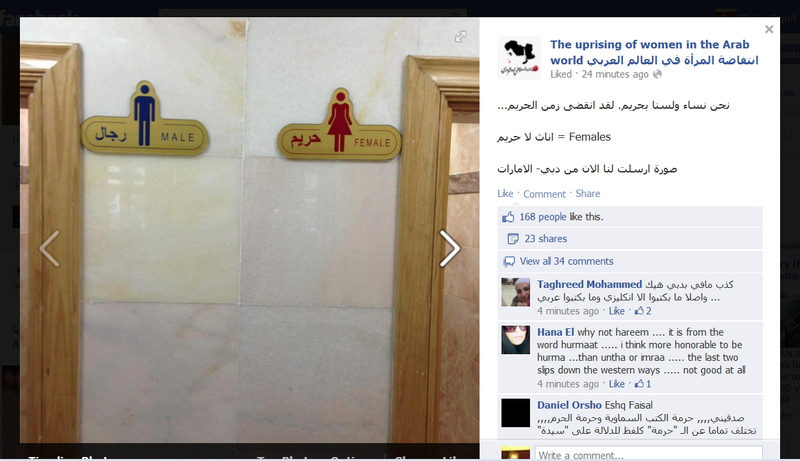 A page on Facebook about Arab women‘s rise as a result and a must in the wake of the Arab Spring. As seen in the photo there are gender signs to show men and women’s rest rooms. This is not the issue, it is the Arabic word written next to the sign. The word used is “Harem”. This word has a derogatory meaning lately. It’s considered a debasing, lowering, disgracing and humiliating Arab women and is opposing the uplifting spirit and status women gained as a result of their contribution and involvement in the Arab Spring. Based on my native language intuition as well as on my academic and professional background, plus my knowledge of my native languages (I am bilingual of Arabic and Turkish), coupled with a very preliminary research, I would like to share what the word ‘Harem’ means and how it is originated. First when you research the word in old books about Islam, let it be “Muslim” or “Bukhari” you will not find the word. The word is rightly derived from the word “Haram” حَرَم which means a ‘sanctuary’ as in the [Al Haram al Makki] referring to the Qa’ba in Mecca, or [Al Haram al Nabawi] referring to the Prophet’s (PBUH) in Al Medina in Saudi Arabia. You even find it used in referring to a university campus [Al Haram al Jaami’i]. This word never was used in the Qu’ran, Muslims’ holy book, in fact, a Suura (verse) came for women but the word used is [nissa’] نساء which is the plural form of the word [mar’a] مرأة the feminine equivalent of [mar’] مرء meaning the person. However, the word [Hariim] or as known in texts as Harem, originated in the Ottoman Turkey during the Ottoman reign, referring to the Sultan’s women who were kept and held hidden from the eyes of all beholders. It was told that they were kept in quarters and courts that had windows with iron rods closely spaced, built with very heavy walls. These quarters housed extremely beautiful women; all were the concubines of the Sultan. 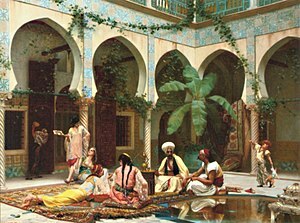 These women who came from all over the world, some were spoils of wars, and some were given as presents to the Sultan, were owned by the Sultan as concubines. They were clothed in silk and ornamented in pearls and diamonds. They were given music, poetry, calligraphy, writing and dancing lessons. They were not servants; their categories resembled very much the Geishas in Japan. The Haram was a very important system the Ottoman Empire and its discipline was of utmost importance. It fact, supervising it was the Sultan’s wife’s responsibility. It was used for the Sultan’s entertainment and recreation. He was the ruler of the world and he had to be in good shape physically, mentally, and of course psychologically. So the Haram was a vital system and particularly taken care of for maintaining the Sultan’s sanity. Then came the West’s interest in the Muslim and Arab after the French campaign in Egypt and Syria, intellectuals, historians, writers, painters and artists became interested in the Arab world. They traveled searching for stories and inspirations. They told stories about the intoxicating exotic Arab world. However, they saw it and interpreted a lot from their own perspective and culture. They did not carry out a deep analysis about many things, one of the concept of Haram. The West saw the Arab world through the eyes of the Orientalists. The misfortune, is that the Arabs also saw themselves through the same eyes of the Orientalists. See Edward Said’s book about how devastating this frame of reference has been. Therefore the word was originated in the Ottoman Empire and from there it got spread to the Arab world which was part of the Ottoman Empire and Khalifat. And the Orientalists added more weight to it through their stories and paintings. The problem is not where the word got originated and why and how it spread. This is a natural process in all languages. Words get borrowed from one country and culture into another. The problem is women in some Arab countries use this word among themselves very casually without paying any attention to it historical connotation. A connotation Arab-feminist-movements so rightly want to eradicate and stop being used. I strongly agree with them. If women don’t start to respect themselves, how on earth do they accept the world to respect them!